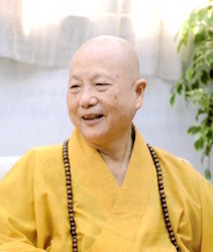 My Dharma name is Da Ying and I was born in 1940 in Hualien Country, Taiwan. My family was engaged in business. As my grandfather had good affinities with Cishan Temple, I was exposed to Buddhism as a child and thus wanted to be ordained as a Bhikkhuni. In 1963, I was tonsured by Master Li Miao Xian, and was called Jin Zong and entitled Da Ying. In 1965, I begged and received the Triple Platform Ordination at Fayun Temple, Dahu Miaoli, Taiwan from Dharma Master Zheng Lian (of Tian Ning Temple, Changzhou, China), Dharma Master Dao An and Dharma Master Nan Ting. In 1968, I was among the first group of graduates from Shoushan Buddhist College, Kaohsiung. I got acquainted with my schoolmate, Dharma teacher Pu Huei, we had become very good friends in the college. After graduation, I returned to the temple for service. In November 1978, the Foundation of Cishan Temple, Hualien City, Hualien Country, Taiwan was set up. Ever since, Cishan Yuan has been renamed Cishan Temple. I took over the duty as the Abbess of the temple. In order for the children in the neighborhood to have a good pre-school environment, a kindergarten was established in September 1983 in the name of Miao Xian, the Dharma name of one of my two masters, to express our gratitude and remembrance. To promote environmental protection and cherish the world, “all-out environmental protection” is a matter of urgency. In order to fulfill the responsibility of a global citizen, protect the Earth’s limited resources, and enhance the quality of the environment, we should pay attention to the severely polluted environment by carrying out environmental protection in our daily lives. Our attention, dedication and participation will upgrade our quality of life, and protect our planet for the sustainable development for ourselves and our future generations as well. Since March 1998, I have done recycling on Sundays in recycling stations which we set up in fixed locations. I think that loving the world by protecting the Earth is also our responsibility as the Buddha’s disciples in order to maintain the Pure Land. To uphold the Buddha’s spirit of saving the world with compassion, we “respond to people’s suffering” and care for the safety of people. Based on empathy, we “see people starving as my starving and see people drowning as my drowning.” Thus, we have given out winter subsidies at the end of each year for 50 years to households with low income. Generally, we also provide emergency aid for accidents, fires, medical treatment, funerals and poverty. From time to time, we donate to restore communities after damage caused by natural disasters and we extend our caring from Taiwan to overseas. To promote Buddhist education, we started to build a lecture hall in 2003 and completed it in 2005 for official use as classrooms for Buddhist studies where aspirants of the Buddha-Dharma learn and establish a solid Buddhist foundation while applying the Buddha-Dharma in their daily lives. Thus, they may attain peace and happiness, and enjoy the refreshing flavor of nectar-like Dharma, which is our educational mission. To uphold the philosophy of “Youth need Buddhism, and vice versa,” we think that youth with advanced knowledge are the future backbone of a country and that wisdom developed from the Buddha-Dharma will help them make appropriate decisions in life. After graduation, they will be able to stick to their positions in society and face life with a positive attitude. Consequently, in July 1993, our temple held for the first time a Buddhist summer camp for college students, and invited the “Chinese Young Buddhist Association,” which was under the guidance of Dharma Teacher Hong Yin, to organize a camp called “Manjushri Wisdom Camp” for that purpose. Children are the future masters of the country, so they should be trained from childhood to be compassionate, bliss-cherishing, diligent and frugal, and respectful to teachers. In 1998, our temple held for the first time a seven-day precepts meeting for Buddhist disciples who keep the Five Precepts and the Bodhisattva Precepts at home in order to spread the Vinaya and perpetuate the Buddha Dharma. We hope that after ordination they would continue to keep precepts, cultivate themselves, follow the Dharma and Vinaya, nurture a wisdom-filled life, stride on the Way, relinquish worries, and contribute effort to home and society. It is called repaying quadruple kindness, which is the duty of Buddhist disciples.